Just how much do you like Qdoba’s Mexican Gumbo? Qdoba Mexican Grill is having a contest that’s custom-made for lovers of their Mexican Gumbo. Through March 6, when you purchase a Mexican Gumbo meal ($5.99, includes a regular-size drink), you’ll be given some Qdoba Mardi Gras beads. Then, from 6 to 8 p.m. on March 7 (Fat Monday? 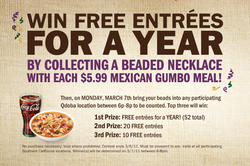 ), bring your bead collection to your favorite Qdoba restaurant to be counted. The customer with the most beads gets a free entre a week for a year. Second place gets 20 free entres. Third place gets 10 free entres. The prizes will be given away at each of Qdoba’s 11 Southern California locations. The contest began last Wednesday (February 9), so you better hurry and catch up. For more information, click here to go to the Qdoba SoCal Facebook page.